A responsive web app for a London-based startup that helps patients find the right doctor. Network Locum is the leading online community for GP locum doctors in the UK; connecting locums looking for work with practices seeking cover. 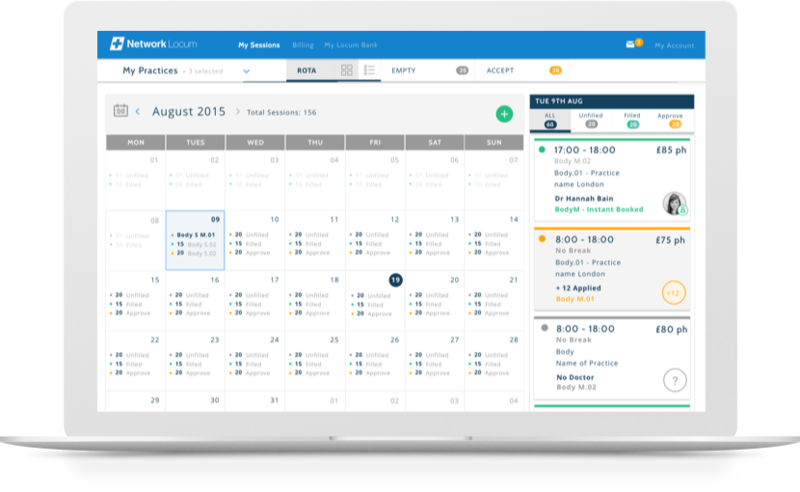 Their web and mobile apps are used by thousands of locum doctors and practices to find work, create schedules, manage billing and more. We were approached to put a fresh coat of paint on the existing Web app and reformulate the frontend. We began by making sure we understood the primary target audience — doctors — which was a new domain for us. We defined a colour palette, typographic styles and new icons for the UI. We then began rewriting the entire frontend codebase on top of Bootstrap. Have an idea you’d like to talk to us about? Enjoy working on meaningful stuff like this? Always hiring designers, devs & PMs. We’re growing fast and are constantly on the lookout for talented designers, developers and project managers to work with us in Toronto, London and Goa. © 2019 DCCPER Holdings Ltd. All rights reserved. Terms Privacy Alrighty then.